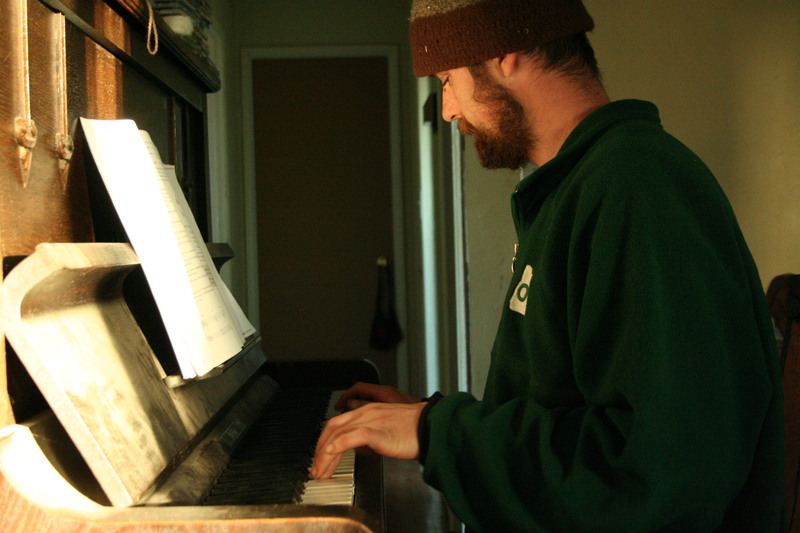 I had saved this photo of the farmer for a Valentine’s Day post, snapped about a month ago on some winter’s day when he was on one of his many piano playing breaks from farm work and the sun was shining through our kitchen window just as to illuminate briefly the beauty ever present in this man (and his music making too). I thought it might be fun for farm members and customers to see him at his other passion, the first one, the one he was immersed in when we met, and the one that helped me fall in love with him. But on Valentine’s Day, this was the scene: four sweet children and a farm that needed tending just as much as the relationship of a woman and a man. That morning the farmer and I–for the two minutes we had alone before leaving the bedroom to join the children at the table to look at the love notes I had written them and the treats of chocolate they each received and the first red rose for our daughter and the many balloons just for fun–wondered aloud to each other how it was that this holiday had turned into a holiday for them, even as we smiled at each other over that same table minutes later at the smiles on their faces. Then for mother and father, the day was off to its everydayness with a homeschool group gathering for me and seedling tending and greenhouse hoop bending for him. Not much later in the day, the baby mounted a fever. And so, even though we managed to enjoy a “special” family dinner that evening, one at which we toasted to the romantic love that was the spark of this family as well as the familial love of six souls that now joined it, afterwards it became clear that there would be no late night rendezvous for the farmer and I to eat our own chocolate and whisper sweet nothings to each other. By that time, the baby was really not doing well–I said good night to my love and tucked that sweet boy to bed and stayed there with him for what was a very sleepless night. The week since then has been full of not only that sick baby, but two teeth of his trying to push through and a few more sleepless nights, as well as the impossible to avoid passing around of the cold/flu that he had to most of the rest of this family. I haven’t had any time for this post; and as for our plan to enjoy a night out with each other this weekend and listen to this cute little bluegrass/pop band at our local pub…the farmer ended up taking his father and some friends instead! And in the face of all this, we both agreed we wouldn’t have it any other way. One of the things that has so poignantly become clear to us as we continue on this journey–aka–get older–is that although we know we should never give up on keeping romance alive and making time for our own dreams and being sure to have some fun and stay creative, the real trick to being happy through it all is to really start to love and thrive on the mundane and the day to day. Let’s face it, that is the real stuff of most of our lives. For us, almost all of our fun and joy happen in the confines of our own home and are sourced from the simplest things, and being happy with that and with each other through it all is both a choice we have made and something that we are thankful suits us pretty well. Valentine’s day; sure, we make it special, but the real life love of each regular day is what is really special to us. In my valentine I have a life partner, a best friend, a great father and incredibly hard worker, not to mention an in house music maker and laugh creator. He is still a pretty great boyfriend too, and he is one of the five loves of my life. This morning, the baby woke up happy for the first time since Valentine’s day, it was such a relief! I think we are now almost out of the woods with the fevers and glossy eyes. And so today–better late than never–I tip my hat to my sweetheart. As for our valentine’s date night, it is–tentatively-on the books for sometime in March!